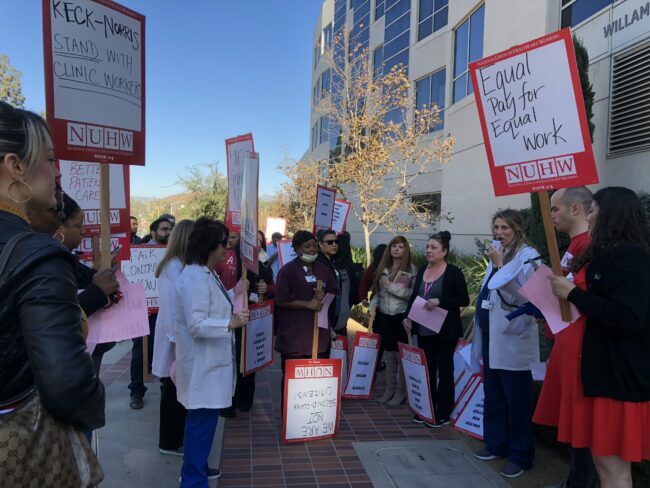 More than 100 USC employees and their allies picketed outside university medical clinics Wednesday demanding a contract that ensures clinic workers receive the same pay and benefits as their counterparts at USC hospitals. Keck Medicine of USC provides its unionized hospital workers with fully paid health insurance, but has resisted extending the benefit to unionized workers at its clinics across Los Angeles. About 140 clinic members recently joined the National Union of Healthcare Workers seeking equality with their counterparts at USC hospitals, and at clinics run by UCLA.